Once again the Players won the toss and new captain Alastair Dunn had clearly researched his history, choosing to put the Village team into bat (6 of the previous 8 encounters have been won by the team batting second). Village captain Mike Dale (again his first go at the role) put experienced pair Harrison and Bewley to open and neither disappointed. Although Bewley was ultimately bowled for 5 off the bowling of Curran, she made a useful contribution, Harrison meanwhile added to his aggregate record of 68 with an unbeaten 13. With Godfrey on umpiring duties Harrison is now the only ever present in the 9 matches to date. Next up was Lisa Thornton who with no square leg umpire gave herself not out in a contentious run out decision, but as everyone knows she is never wrong. She went on to make 3, equalling her previous record before being bowled by Patrick. Joining her at the crease was Mike Dale who made his usual quick fire contribution although his unbeaten 13 did not close the gap on Harrison in the race to be top overall run scorer. 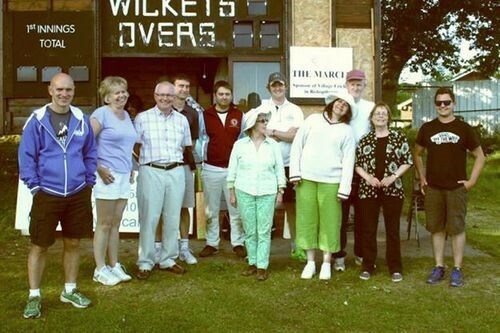 Having made a strong start, the middle order continued in similar vein with local personality Nick Smith making a welcome return from injury to make an unbeaten 10 ably supported by debutant and Parish Councillor Mike Elsworth who made 12 in 2 6’s off 2 balls, a record. Another debutant Joe Ballantyne also retired unbeaten on 10 before the Village team began to run out of steam a little with Jemison controversially given out lbw for 0 Councillor Gajewicz complete with runner but sans anorak (it was a hot night) making 1, joined by Councillor Green who came in too late in the innings to trouble the scorers. So the Village Select team ended their innings with a very respectable target of 91. Missing a number of key players the Players began their task with pluck. Although Linfoot was out early on bowled by Ballantyne for 1, new boy Ned Curran decided to punish some errant bowling retiring unbeaten on 13 with a 6 and a 4 included in his innings. Enter Tracey Patrick (yes she likes that sort of thing) looking to make some runs or grab as much attention as possible and she achieved both, making a career equalling best of 7 all singles, before being caught Elsworth off the bowling of Bewley. The youngest person on the pitch Charlotte Beadle joined Patrick at the crease only to be heading in the opposite direction shortly afterwards without troubling the scorers but no doubt she’ll learn from the experience and be a better person for it. Captain Alastair Dunn came in to try and steady the ship as the run rate was falling behind and the Players were leaking wickets. A steady innings followed although Dunn didn’t walk on 10 as convention dictates but had to be ordered off after adding an illegal 2 runs to his score to finish unbeaten on 12. He had been joined at the crease by former captain Davis who like his more illustrious England counterpart had been feeling the pressure after a run of dismal results and poor form with the bat. However unburdened with the responsibility of leadership Davis flourished and what he lacked in grace, finesse and skill he made up for in dogged determination (some would say like his acting) as he charged down the wicket seeking quick runs and redemption. However his efforts were not matched by his partners as Diane Curran and Matt Taylor departed in quick succession for ducks, Curran repeating last years feat of being run out again for nought whilst Taylor was hit by a sucker punch after the usual wayward bowling from Smith lulled him into a false sense of security. Only when Steve Patrick joined the fray did Davis have a worthy partner but needing 21 to win off the last over the task proved beyond them, despite some classy batting from Patrick including a last ball 6 leaving him unbeaten on 12 and defeat for the Ebor Players by 10 runs. They now trail in the series by 5 games to 4. A big thank you must go to all who helped make this a successful evening.